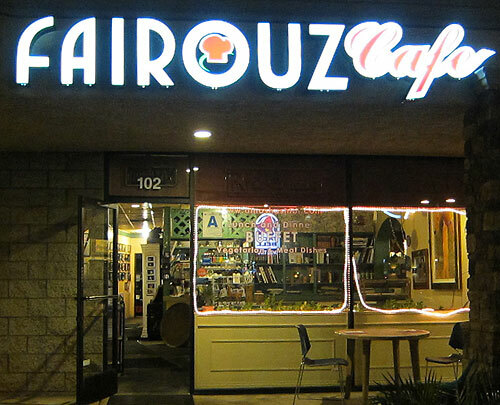 I had the great pleasure of stumbling upon the Fairouz Cafe in San Diego, California a few days ago. My family had been to the San Diego Zoo and needed a late night meal. Too many places were closed and we were about to give up when we found Fairouz. Being Greek, I’m always up for trying Greek food, and I like Lebanese food as well. Very similar. I had the Gyro plate, which came with a large portion of finely spiced lamb, tsatziki, lettuce and red onions. The lamb was very mild and delicious. My daughter had the dolmas (pictured below), which were a vegetarian rice dish wrapped in grape leaves. Greeks have a similar dish called dolmathes. The dolmas had a very unique flavor and were quite large. Very very good. My wife and I shared a bowl of Greek lemon soup, or avgolemono. Fairouz’s greek lemon soup was perhaps the best I’ve ever had. One of my other kids had a wonderful salad, pictured below. 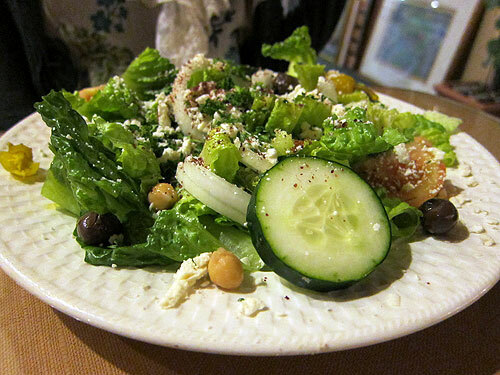 If you are in the San Diego area, do yourself a favor and dine at Fairouz! You’ll be very glad you did. I’ll make it a point to go back the next time I’m in town.